The main function of the kidneys is EXCRETION. They remove urea from the blood in a two stage process described in an earlier post, first by filtering the blood under high pressure in the glomerulus and then selectively reabsorbing the useful substances back into the blood as the filtrate passes along the nephron. But the kidney has an equally important role in HOMEOSTASIS. It actually is the main effector organ for regulating a whole load of variables about the composition of the blood (e.g. blood pH and salt balance) but in this post I want to explain to you how the water balance of the body is regulated and the kidney’s role in this homeostatic system. Why do you need to regulate the dilution (or water potential) of the blood? If the blood becomes too concentrated, then water will leave the body cells by osmosis. Cells will shrivel up as they lose water into the blood and this will kill them. Bad news all round…. Remember: a hypertonic solution has a low water potential and is very concentrated. A hypotonic solution has a very high water potential and is very dilute. The regulation of the water potential of the blood is a very important example of homeostasis in the human. It is often referred to as OSMOREGULATION. 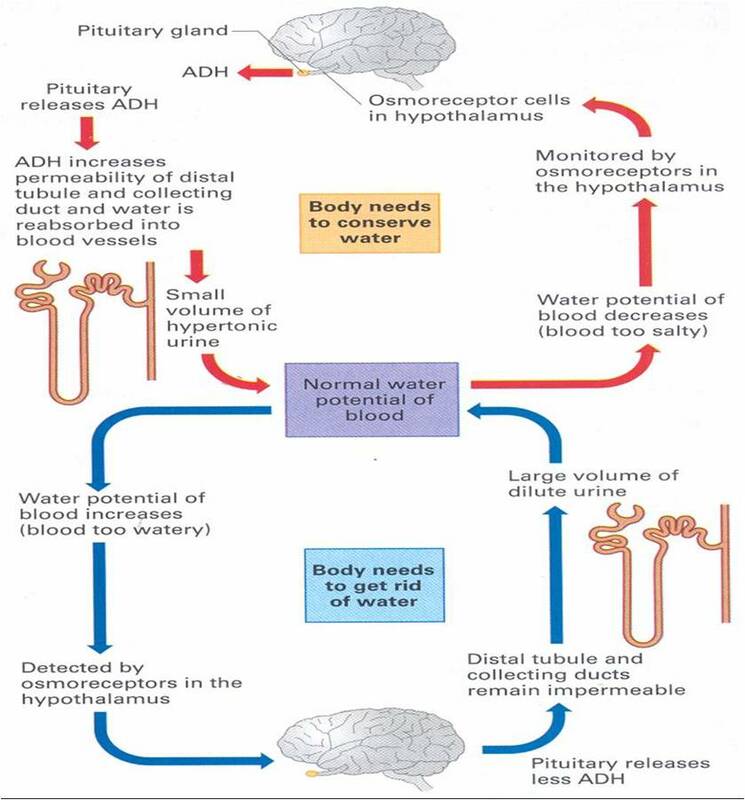 The water potential (dilution) of the blood is measured continuously by a group of neurones in a region of the brain called the hypothalamus. 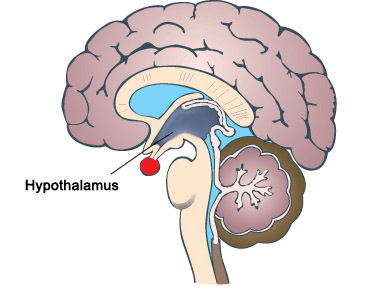 The hypothalamus is found right next to a very important hormone-secreting gland called the pituitary gland, marked as the red circular structure on the diagram above. When the hypothalamus detects that the blood’s water potential is dropping (i.e. 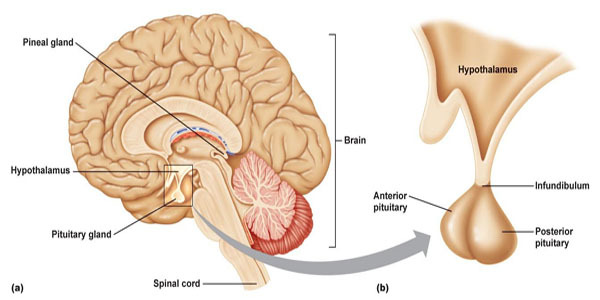 it is getting too concentrated) this causes the posterior lobe of the pituitary gland to start secreting a hormone ADH into the bloodstream. Hormones such as ADH exert their effects elsewhere in the body. The main target tissue for ADH is the collecting duct walls in the kidney. ADH binds to receptors on these cells and makes the wall of the collecting duct much more permeable to water. This means as the urine passes down the collecting duct through the salty medulla of the kidney, lots of water can be reabsorbed into the blood by osmosis. This leaves a small volume of very concentrated urine and water loss is minimised. ADH is secreted whenever the body is dehydrated. It might be because the person is losing plenty of water in sweating in which case it is vital that the kidney produces as small a volume of urine as is possible. If you drink a litre of water, what effect will this have on the dilution of the blood: of course it makes the blood more dilute. This will be detected in the hypothalamus by osmoreceptors and they will cause the pituitary gland to stop secreting ADH into the bloodstream. If there is no ADH in the blood, the walls of the collecting duct remain totally impermeable to water. As the dilute urine passes down the collecting duct, no water can be reabsorbed into the blood by osmosis and so a large volume of dilute urine will be produced. 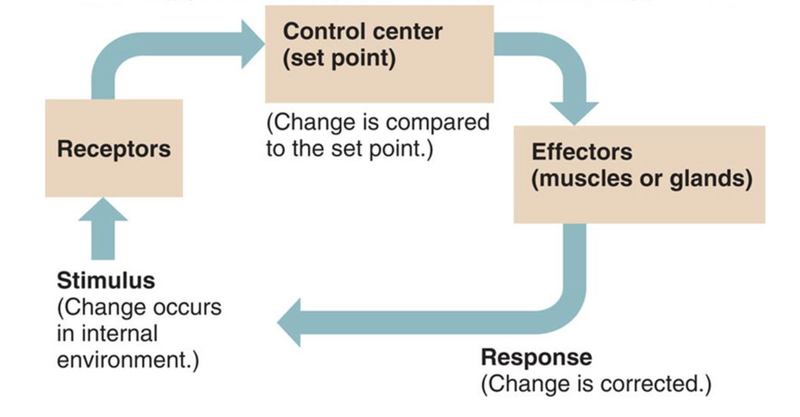 This is another beautiful example of negative feedback in homeostasis. PMG tip: you can avoid getting confused in the exam about the effect of ADH if you can remember what it stands for. ADH is an acronym for anti-diuretic hormone (ADH). A diuretic is a drug that promotes urine production. They are banned drugs from WADA (World Anti-Doping Agency) since they can be taken as a masking drug to help flush out evidence of illegal drug taking. Shane Warne missed the 2003 cricket World Cup and served a ban for failing a drugs test due to diuretics in his sample. So an anti-diuretic hormone will reduce urine production. This means it will be secreted when the body is dehydrated as the blood gets too concentrated. Finally remember that it is not the whole nephron that is affected by ADH, just the collecting ducts and part of the distal convoluted tubules. 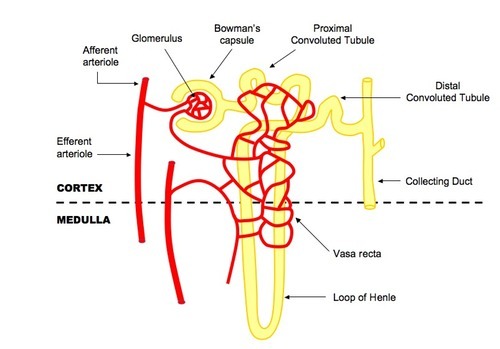 Most water in the glomerular filtrate is absorbed in the nephron but the collecting duct has a role in “fine-tuning” the volume and dilution of urine. Excretion is defined as “the removal of waste molecules that have been produced in metabolism inside cells”. So for example carbon dioxide is a waste product of respiration and is excreted in the lungs. The liver too produces a waste molecule urea from the breakdown of amino acids. Amino acids and proteins cannot be stored in the body: if you eat more than you use, the excess is broken down to urea. Urea would certainly become toxic if it was allowed to accumulate in the body (patients with no kidney function will die within 3-4 days without treatment) and the organ that is adapted to excrete urea from the blood is the kidney. 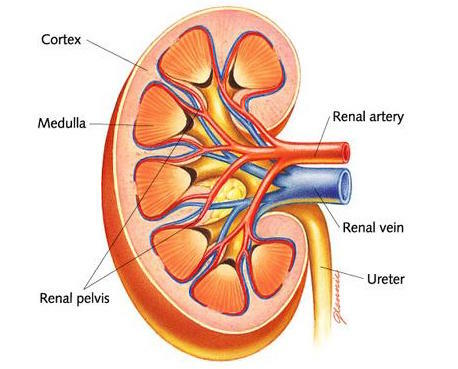 Kidneys excrete urea by dissolving it in water, together with a few salts to form a liquid called urine. 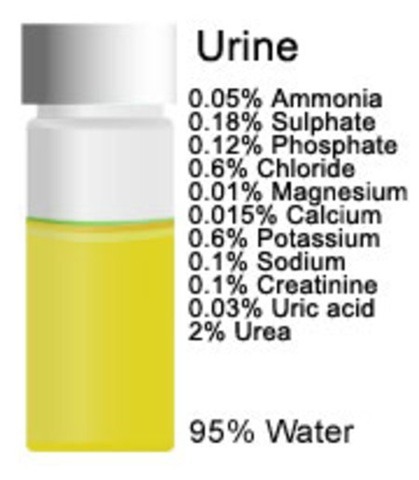 Don’t confuse urine, the liquid produced in the kidney that is removed from the body, with urea, the nitrogen-containing chemical made in the liver that ends up as one component of urine. Urine is produced in the kidneys continuously day and night. It travels away from the kidney in a tube called the ureter. 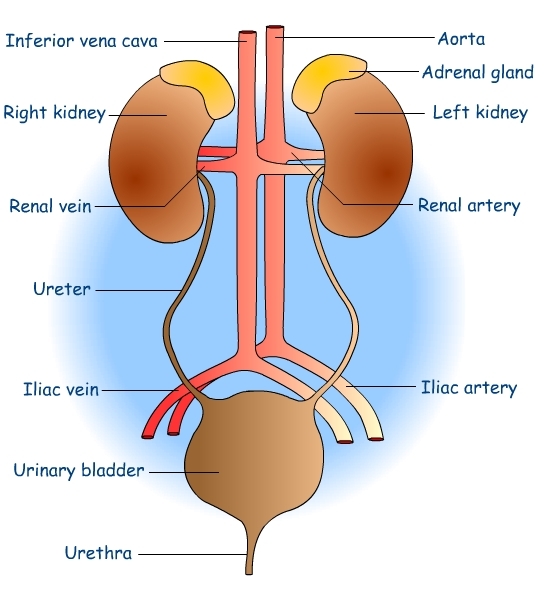 Each kidney has a ureter coming out of it, and the two ureters carry the urine to the bladder. The bladder is a muscular storage organ for urine. Urine drains from the bladder through a second tube called the urethra. Make sure you check your spelling: ureter and urethra are easy to muddle and correct spelling is essential to ensure the meaning is not lost…. How is urine made in the kidney? Well that’s the big question for this post. How does the kidney start with blood and produce a very different liquid called urine from it….. Urine is basically made of water, dissolved urea and a few salts. Before I can explain how urine is made, I need to briefly look at the structure of a kidney. You can see the structure of the kidney on this simple diagram. There are three regions visible in a kidney: an outer cortex, an inner medulla which is often a dark red colour due to the many capillaries it contains, and a space in the centre called the renal pelvis that collects the urine to transfer it into the ureter. Blood enters the kidney through the large renal artery and deoxygenated blood containing less urea leaves the kidney in the renal vein. But there is no way from looking at the gross structure of the kidney that you could ever work out how the Dickens it produces urine. This requires careful microscopic examination of the kidney. Each kidney contains about a million tiny microscopic tubules called nephrons. The nephron has an unusual blood supply and an understanding of what happens in different regions of the nephron allows an understanding of how urine is made to be built up. 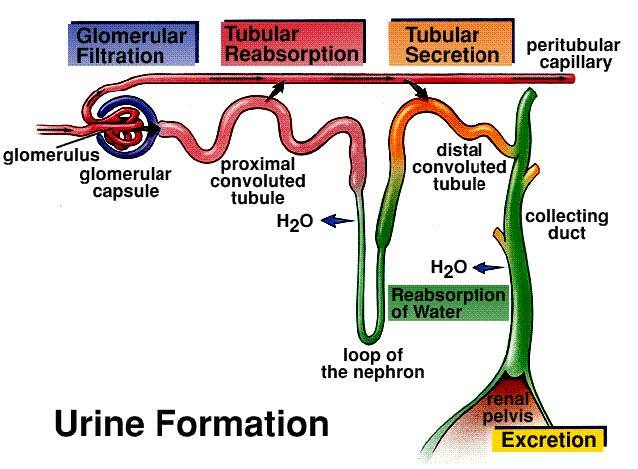 The nephron is the yellow tubule in the diagram above. It starts in the cortex with a cup-shaped structure called the Bowman’s capsule. This cup contains a tiny knot of capillaries called the glomerulus. The Bowman’s capsule empties into the second region of the nephron which is called the proximal convoluted tubule. The tubule then descends into the medulla and out again in a region called the Loop of Henle. There is then a second convoluted region called the distal convoluted tubule before the nephron empties into a tube called a collecting duct. The collecting ducts carry urine down into the renal pelvis and into the ureter. Blood is filtered in the kidney under high pressure, a process called ultrafiltration. Filtration is a way of separating a mixture of chemicals based on the size of the particles and this is exactly what happens to the blood in the kidney. Red blood cells, white blood cells and platelets are all too large to cross the filtration barrier. Blood plasma (with the exception of large plasma proteins) is filtered from the blood forming a liquid called glomerular filtrate. The kidneys produce about 180 litres of glomerular filtrate per day. 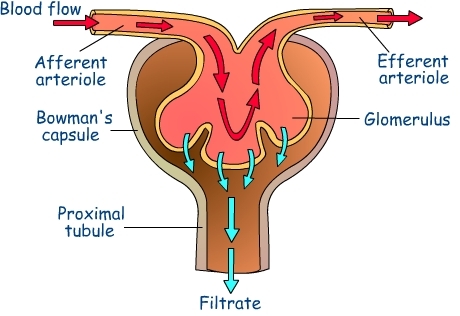 Ultrafiltration happens in the glomerulus and the glomerular filtrate (GF) passes into the Bowmans capsule. The high pressure is generated by the blood vessel that takes blood into the glomerulus (afferent arteriole) being much wider than the blood vessel that takes blood out of the glomerulus (efferent arteriole). The plasma of blood (minus the large plasma proteins) is squeezed out of the very leaky capillaries in the glomerulus and into the first part of the nephron. As well as containing urea, water and salts, glomerular filtrate also contains many useful molecules for the body (glucose and amino acids for example) so these have to be collected back into the blood in the second stage….. The useful substances in the glomerular filtrate are reabsorbed back into the blood. This can be by osmosis (for water) or by active transport (glucose and amino acids). All of the glucose and all of the amino acids in the GF are reabsorbed in the proximal convoluted tubule by active transport. Remember active transport can pump substances against the concentration gradient using energy from respiration. Almost all the water in GF is reabsorbed by osmosis in the proximal tubule too. 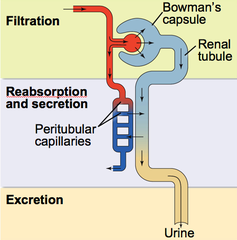 So that leaves the question, what is the rest of the nephron doing…? Well this is where it gets much more complicated…… Extra urea and salts can be secreted into the nephron at certain points along the tubule. 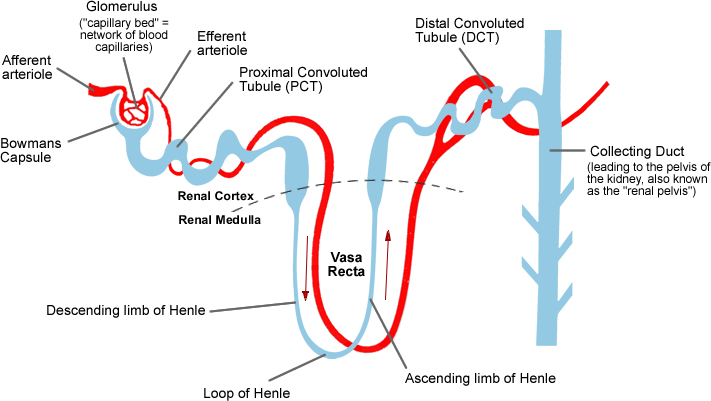 The Loop of Henle allows the body to produce a urine that is much more concentrated than the blood plasma. And much of the distal tubules and collecting ducts are used for the second function of the kidney: homeostasis. But you will have to wait until my next post to find out how the kidney fulfils this crucial second function… Please add comments or questions to this post – I really value your feedback… Tell me what is unclear and do ask questions…. 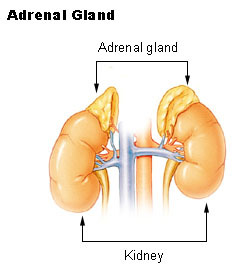 Adrenaline is a hormone produced in the adrenal glands which are found on top of the kidneys in the abdomen. A hormone is “a chemical released by a specialised gland called an endocrine gland into the bloodstream. The hormone travels around the body in the blood plasma and then causes an effect elsewhere in the body by binding to receptors found on certain target cells”. You should know some other examples of hormones – testosterone, oestrogen, progesterone, ADH – to name a few. Please learn this definition too: it would be wonderful if you got a 3 mark question asking you to define a hormone…. There are many cells in the body that contain receptors for adrenaline. This allows the hormone to exert an effect on a wide variety of tissues. For example there are adrenaline receptors in the pacemaker of the heart and adrenaline will cause the heart to beat faster (more beats per minute) and also with more force. When is adrenaline released by the adrenal glands into the blood? Adrenaline is secreted into the blood in times of danger or stress. It prepares the body to either run away from the danger or indeed to battle against it. For this reason, adrenaline is often described as a “fight or flight” hormone. What are some of the effects of adrenaline? Liver Liver breaks down glycogen into glucose to raise blood glucose conc. The overall effect is that the skeletal muscles are supplied with more oxygen and more glucose so they can respire aerobically. This allows the muscle to contract more efficiently.